The family casual dining franchise, known for prize-winning wings, more than 20 wing sauces, and a motor-themed décor, has introduced an updated menu featuring amped up flavors across every food category, says Lance Matthews, corporate chef for Quaker Steak & Lube, who brings more than 25 years of culinary experience to the brand. The new menu boasts a bounty of fresh flavors found in shareable appetizers, street foods, lighter-fare salads and entrees, and signals a move by the brand to go in-house with the creation of soups, sauces, and other foods. 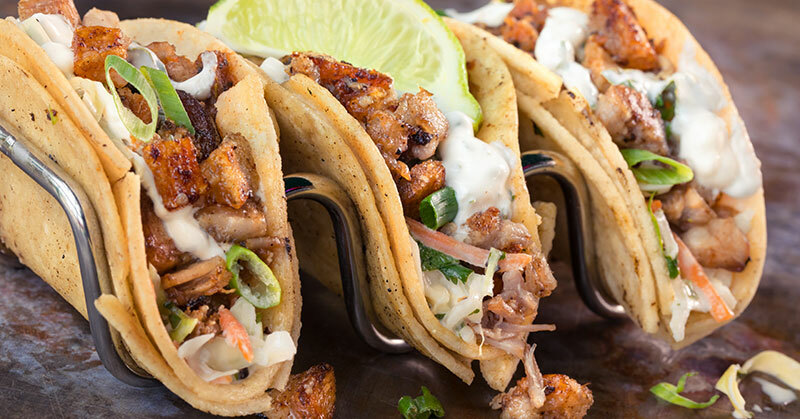 Think crispy pork belly sliders and authentic street tacos with jalapeno lime slaw, cilantro lime cream and house-made fire roasted salsa; and specially seasoned fried chicken, with a touch of spice and a unique citrus finish, topped with organic honey to marry the flavors. Never fear, Matthews says, the wings haven't gone anywhere. "No matter what we do, we are definitely known for our wings - it is in the sauce," says Matthews. "We are trying to introduce new flavors and textures to our menu, while staying relevant to the current trends that go beyond just wings, to enhance additional items like pork, steak, and seafood." Popular core menu items remain, with a twist. Pretzels have been upgraded to true Bavarian style, with a beer-cheese dipping sauce; and real Wisconsin cheese piles the top of the popular house-made chips to create Cheese Curds & Lube Chips. "When we look to make a change we consider three questions: What is the wow factor? Is it executable? And, is it margin friendly?" notes Matthews, a culinary school graduate, who served the U.S. Navy as a cook and search and rescue swimmer, before sharpening his skills at several notable hotels, including San Diego's Hotel del Coronado, under famed Executive Chef Jay Pastoral. Matthews' diverse culinary background brings a "new edge" to the menu, while honoring the heritage of the brand, says John Ponczoch, head of TA Restaurant Group and senior vice president of TravelCenters of America, which acquired Quaker Steak & Lube in 2016. "We've been in the restaurant franchise business for more than 20 years, so we understand the need to evolve with changing consumer tastes. It's critical to have a corporate chef that not only is able to incorporate current trends into our diverse menu mix, but also anticipate future trends to keep us one step ahead of our competition," says Ponczoch. "As the franchisor of a legacy brand like Quaker Steak & Lube, we have a commitment to helping our franchisees' businesses thrive. By continuing to offer craveable favorites that have kept loyal fans coming back for over 40 years, while offering guests new, bold flavors, we're elevating The Lube experience." Rolling out a massive menu change requires many moving parts and Quaker Steak was up for the task. Plans to execute the new menu within the franchise community were underway months before the rollout, and included chef-created recipe and prep cards, a franchise training guide, webinars, and ongoing operational support in the field long after patrons savored their first new menu bite. Franchisee feedback and guests, who voted with their mouths and plates posted on social media, reveal the new creative fare is already a hit and successfully reflects the Quaker Steak & Lube mantra to create, innovate, and engage, says Andi Rice, marketing director of restaurants at TravelCenters of America. "There is always something happening at the Lube," she says. "We will continue to bring great food, drinks, and fun and that really is what sets us apart, in terms of our chain, and what we like to bring to our guests. There is always something happening nationally and locally, and it is embraceable in each location. It is the heart and soul of who we are." As the brand continues to supercharge franchise development in its quest to expand nationwide, you can bet Matthews will be constantly looking for unique ways to serve up tastes at the Quaker Steak & Lube tables. "We definitely will continue to monitor trends and focus on any items out there that we can roll into our brand," says Matthews. "If it is coming, we would like to be the leaders, and not just the followers. We want to stay ahead of trends, follow trends, and continue to monitor food and grow our brand - we want to take it nationally--that is our sole goal."